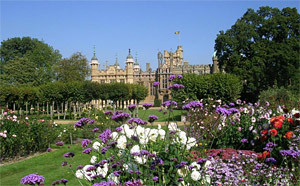 The bountiful home-county of Hertfordshire boasts of a number of impressive gardens and landscapes. Many have deep historical connections to the landed gentry and aristocracy, and some even with Royalty. 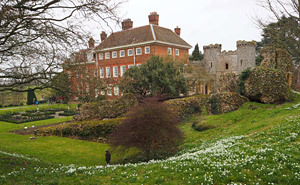 The remains of a Norman Castle and 17th-c brick mansion with sweeping lawns, that lead to a kitchen garden, rockery, winter garden, rose garden and a pond with marginal planting. Magnificent carpets of snowdrops and bulbs in spring. 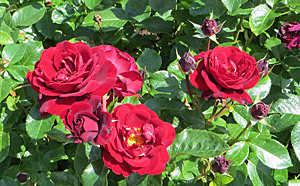 Followed by flowering shrubs and richly planted herbaceous borders in the Summer. A fascinating series of over 60 display gardens, incorporating a wide range of different designs and materials. Includes a large walled garden, mature shrub borders, water features and wildflower and woodland areas. 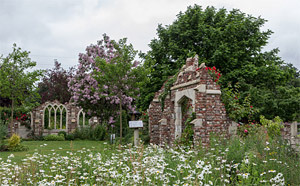 The Folly Garden (shown above) was developed to provide a signature garden for the site. Magnificent 17th-c Palace enclosed by 42 acres of formal Gardens, designed by John Tradescant. They include a Jacobean knot garden with authentic planting, a herb garden, Victorian Maze, scented garden and open parkland areas. Contains an important collection of plants from around the world. Formal gardens laid-out by Edwin Lutyens in 1908. 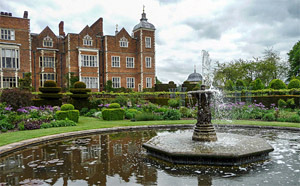 They include a walled garden, a maze, rose gardens, herb garden (designed by Gertrude Jekyll) and a vast deer park. Children will enjoy the dinosaur trail in the wilderness garden, miniature railway and adventure playground.